Quench, nourish and replenish your hair with KMS Moist Repair Shampoo. This weightless yet l.. Hair lacking luster and shine? Simply restore the hair's shine and body with KMS Moist Repair..
Gently cleanses, conditions and moisturizes stressed hair. No additional shampoo or cond.. Enhance the health of your scalp now! 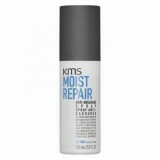 The KMS Moist Repair Leave-in Conditioner nourishes you..
KMS MOISTREPAIR Anti-Breakage Spray is designed for all hair types: spray into mid-lengths and en..